Are courts blocking the public's right to know? Two nationally known reporters face possible jail sentences for refusing to answer grand jury questions about their confidential sources in the criminal probe of the leak of the name of a U.S. intelligence agent. 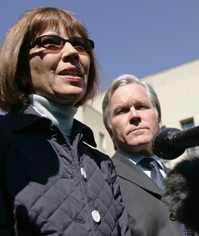 The contempt of court case against Matthew Cooper of Time and Judith Miller of The New York Times is one of several similar conflicts between journalists and prosecutors and private lawyers viewed as less favorable to freedom of the press. Prosecutors say journalists have the same obligation as anyone else to give evidence in legal proceedings. But journalists say that offering confidentiality to sources wishing to remain anonymous is sometimes necessary to get information about government and corporate wrongdoing, such as the Abu Ghraib prison abuses and the Enron accounting-fraud scandal. Meanwhile, media groups are clashing with the Bush administration over restrictions on government information imposed since the 9/11 terrorist attacks.